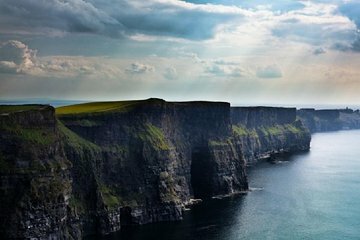 This express tour packs all of the natural highlights of southern Ireland into one hassle-free trip. This tour was fantastic. I highly recommend it because you learn the history of the area that you may not know if you tour on your own. You can simply drive up, park and pay if you want to go on your own, but I cannot say enough great things about the tour and guide. He was very knowledgeable and helpful. Advice: check the weather - duh- but seriously. It is a lot colder on the cliffs because of the wind - so dress warmly, otherwise you'll be buying hats and scarf from the lovely gift shop. Also leave time for the exhibit on sight. It was excellent. Great tour and highly recommend it! Our very knowledgeable bus driver told us about Ireland's history along the way to the Cliffs. We ate lunch in a quaint town, Doolin, then drove to an area known as the Burren. A beautiful sunny day at the Cliffs provided some amazing scenery. We were blessed with good weather on the day after Ophelia had hit the area. I would have preferred a little more time at the Cliffs, but thats what I say about all the places I really enjoy. This is one of the must see places in Ireland. The places we saw were fabulous,everything we hoped for. However, the driver was not really a tour guide and seemed to struggle with how to fill in the time driving. He could have just played Irish music and let us look around, but he talked about a lot of nothing, maybe 7 sentences of Irish history, and sang to us. I have taken many other Viators in other countries and some in Dublin. I never went with such a large group as on this big bus. I prefer van size tours or a small bus. When there was a lunch stop, it was rushed and crowded so people at the end of the line had 10 minutes to eat as opposed to the people who got in line first. Viator should let people know the size of the tour group so people who don't mind large bus groups could choose that, and people who prefer van size tours could choose those. Excellent tour and great scenery. Tour guide dropped us off about 3 blocks from where we were picked up and we had to walk to the area we parked our car ...especially in a strange city and certainly not within sight of any familiar landmarks. Guide said hen couldn't drop us off at the same location he picked us up but when we called the tour operator we were told pick up and drop off was at the same location. Good thing the tour itself was good. DRIVER WAS SO FUNNY !! Had a great day. Wonderful day ! Weather turned out great! The bus Driver Rory was entertaining and funny! Enjoyed the Cliffs and the history and commentary ! Weather turned really bad on the drive back, but Rory was exceptional in taking care in driving. Felt very safe. Beautiful sights!! A must-do when in Ireland. Highly recommend the Paddywagon tour. This was a long day with a lot of walking so be prepared - we were. The sites were amazing and the driver and narrator were both excellent.